The PROGRASS demo plant is built on a truck and like that it easily can be shifted to any location. 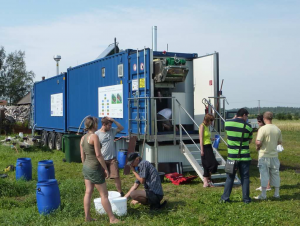 After the first very successful demonstration time in Germany it started in July 2010 a 2 years demonstration circuit through Northern and Western Europe. At each location it can be visited. The prototype continued its demonstration trip to Aberystwyth where it arrived on the 15th of October 2010. 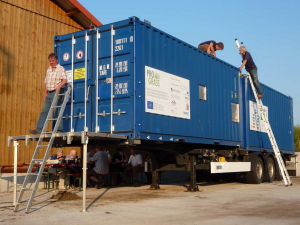 Before that, there was a small pit stop to do some repair work on the biogas fermentation units in Germany. The prototype found a perfect place on the IBERS farm unit, neighbouring other prototype plants. The plant was set up, the fermentation units were inoculated with cow slurry and the maintenance of the prototype was explained and handed over to John Corton, PhD Student at IBERS. The first scientific samples have been processed and lab work already started. Demonstration events take place, the first 50 visitors have already seen the demonstration plant, most of them students. The PROGRASS prototype has been in Estonia for 9 very successful weeks with a lot of visitors and media attention. Roundabout 100 visitors got useful information about the IFBB system and its advantages. There were all kind of visitors, including students, researchers, politicians, farmers and journalists. Dr. Kathrin Heinsoo and Indrek Melts from the Eesti Maaülikool (Estonian University of Life Sciences in Tartu) organised the work with the prototype and also the demonstration events. Our scientific recording of data from the prototype could be continued. 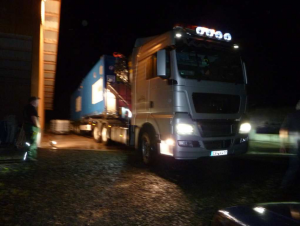 The truck with the demo-plant reached its Estonian destination punctually on a wonderful sunny day. It was expected by the Estonian PROGRASS team; Dr. Kathrin Heinsoo and Indrek Melts from Eesti Maaülikool University, Tartu and from Lutz Bühle and Frank Hensgen, project executives and doctoral students of Kassel University. Due to the extensive experiences gathered in the Vogelsberg period the plant could be installed and started with a very short time. Operation started with dehydration of test charges for scientific purposes. After successful accomplishing the tests the demonstration runs of the plants could be started at the second European PROGRASS site. The arrival of the plant was already reported in the regional newspapers, the internet and it was subject of a radio broadcast. 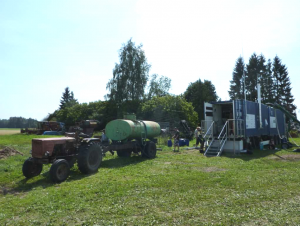 On July 14th the PROGRASS demonstration plant was prepared to be moved from Vogelsberg to Estonia. The successful start of the tour was celebrated with a farewell barbecque of all participating PROGRASS-stakeholders from the region of Lauterbach. In this first half-year the team was busy implementing, preparing and testing the prototype and with numerous demonstration sessions since the public attraction of the project was far beyond our expectations. The plant was demonstrated within 15 presentations for an audience of more than 500 persons. The audience was a heterogeneous groups, not only farmers or public administrations but also students from agricultural vocational schools, staff from manufacturers and related industries and members of environmental groups took the opportunity to receive actual information on state of the art IFBB technology and the PROGRASS approach. The press reported extensively about PROGRASS, the scope ranging from local and regional media in Vogelsberg and Witzenhausen to state- and nationwide press coverage and TV broadcasts.